This post is a follow up to Part I – WBC11 Virginia Must Follows and Resources (winery, VA bloggers, and other VA wine industry Twitterers to follow). 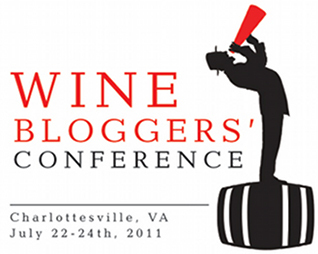 As the 2011 Wine Bloggers Conference (WBC) in Charlottesville, VA nears, I’m getting more questions about airports, transportation and things to do in the Charlottesville area. From the emails I’m receiving, it seems as if many WBC11 attendees are bringing their family along and are going to make a summer vacation out of the trip to Virginia. I suspect there will be more detailed logistics and travel related information posted on the Wine Bloggers Conference (WBC) website in the coming weeks, but in the meantime, I am providing the following Twitter, travel, logistics, and ‘to do’ information for the early planners. I. – WHO TO FOLLOW? There are a number of Virginia wine Tweeters that WBC attendees should follow to learn more about Virginia wine leading up to the conference. I previously posted a list of Virginia wine bloggers, Virginia wineries, and industry folks here (Part I – Va Wine Must Follows). Since the number of Virginia wine bloggers and tweeters seems to grow on a weekly basis, this list does not include everyone, but does provide a great starting point (apologies if I left someone off the list – please let me know via email or Twitter: @DrinkWhatULike ). Charlottesville Albemarle Airport (CHO). CHO is a smaller, regional airport with a limited number of flights, but a great option if you can manage it because it’s only 10 miles away from the WBC11 host hotel. Richmond International Airport (RIC). Approximately 73 miles from Charlottesville, under 90 minute drive to downtown Charlottesville. RVA is a smaller airport, and much easier to get in and out of than Dulles and Reagan. Washington Dulles Airport (IAD). Approximately 105 miles from Charlottesville, about a two-hour drive. Since I pass through this airport on a near weekly basis, IAD has a special place in my heart *sarcastic font*. The advantage of IAD is the number of flights, and most importantly, there are two VinoVolo wine bars in the airport, which make long layovers or flight delays more palatable. The original VinoVolo is located by gate C4, and the other is located in the middle of concourse B across from Chipotle. Another advantage of flying in/out of Dulles is the proximity to the wineries of Loudoun County – just a 45-minute drive. For those interested in participating in a pre/post-conference tour of Loudoun County, please email me. Washington Reagan Airport (DCA). About 115 miles from Charlottesville, over two-hour drive (could be considerably longer depending on traffic). One of my least favorite airports in the US due to the human congestion element – choose this as your last resort. One upside of flying in to DCA is the public transportation option for those not renting a car. You can take the METRO from DCA directly to Union Station train station and then take Amtrak to Charlottesville. See below for more details. For those that enjoy scenic (semi-scenic) rides on the rail, there is an Amtrak station located in Charlottesville (CVS), a short walk from the downtown mall area. The host hotel, Omni Charlottesville, is located at the far west end of the downtown mall. Although the Amtrak station is about a 10-minute walk from the Omni hotel, I wouldn’t recommend this particular walk in July unless you enjoy extreme sweating as summers in Virginia can be hot and very humid. There are always cabs readily available outside the Amtrak gates. One-way tickets from Washington Union Station to CVS, cost between $22 – $38, and the trip will take about 2 1/2 hours. Omni Hotel. As the host hotel, this is clearly the most convenient option in terms of being in the ‘middle of it all.’ There are a number of other hotels near the downtown mall like the Courtyard Marriott. I would recommend Hotels.com for a complete list. Resort Option. If you’re bringing your entire family to Charlottesville or traveling with a spouse who’s not in to wine (I can’t imagine such a thing), the resort option may be the way to go. The only resort I’m personally familiar with is Keswick Hall. My wife and I stayed at Keswick a few years ago to celebrate our anniversary and had a great time – beautiful rooms, amazing setting, and stellar service. A second option is The Boar’s Head Inn. Although I’ve played golf at The Boar’s Head many times, I’ve never stayed at the Inn, but have heard great things. Both places have a full spa, swimming pool, on-site golf course, tennis courts, and restaurants. James Monroe’s Ashlawn-Highland – Home of our fifth President, this 500 acre estate, highlighted by peacocks running around the grounds, is a must visit. Edgar Allen Poe Room – Author and poet’s room restored to 1826 time period, when he was a student. Small Special Collections Library – A must visit for ‘bookies.’ Over 12 million manuscripts and 300,000 rare books. University of Virginia – Founded by Thomas Jefferson, a walk around the historic and beautiful campus is highly recommended. Carter Mountain Orchard – Ownership of this land dates back to 1729, when the honorable John Carter acquired 9,350 acres of land by way of a land grant. Today, the ‘pick your own’ Carter Mountain orchard is a great place for a day of family fun picking apples, enjoying expansive views of Charlottesville below, and enjoying perhaps the worlds very best, fresh baked cider donuts! If you’ve never spent time in our nation’s capital, perhaps a trip to Virginia for WBC11 is the chance to make time to visit Washington, DC. Growing up in Virginia, school trips to Washington, DC were part of our history and political science classes. I’m always surprised at how few people take advantage of the educational experience provided by visiting Washington, DC. While in Virginia this summer, give consideration to spending a day or two in DC to take in the sights – the Washington Monument, Lincoln Memorial, Jefferson Memorial, or contact your member of Congress for a tour of the Capital or the White House (especially if you are traveling with school age kids). There is no shortage of running trails in Charlottesville. Given the Virginia heat and humidity in July, I highly recommend early morning runs. The University of Virginia campus provides a lovely backdrop for an early morning run, or Run.com lists a number of running trails and loops near UVA. Charlottesville is home to a number of excellent golf courses, with two notable must play courses if you bring your clubs – Keswick Hall Golf Course and Birdwood Golf Course, both about a 15 minute drive from downtown Charlottesville. There are a ton of community events happening throughout the summer in Charlottesville. CvilleCalendar.com is an excellent source of event information for the Charlottesville area. If you are traveling with your pooches, Keswick Vineyards hosts ‘Yappy Hours’ each Sunday. Aside from great wine and one of the friendliest tasting room staffs in Virginia wine country, Yappy Hours at Keswick Vineyards provides a great chance for you to enjoy a glass of Virginia wine while your dog sniffs and socializes. For the more refined or curious, take in a Polo match at King Family Vineyards each Sunday throughout the summer. Not only will WBC attendees have the opportunity to taste the finest wines of one of the most promising wine regions in the US, conference goers will also be introduced to Virginia hard apple cider. As an adjunct to a thriving wine industry, Virginia is home to a blossoming apple cider industry. Two Virginia cideries will be participating in WBC11 – Foggy Ridge Cider and Albemarle Cider Works. For those new to hard apple cider, please check out ‘Virginia Cider 101‘ article by Foggy Ridge cider maker, Diane Flynt. Charlottesville is home to a number of excellent restaurants – too many to do justice here, but below are a few that I highly recommend that are relatively close to downtown. C&O Restaurant. Located on the downtown mall, one of the most established restaurants in the area. My restaurant in Charlottesville. Fossett’s Restaurant at Keswick Hall. Highly recommended, most excellent. You’ll need a reservation. Hamilton’s at First & Main. Ivy Inn Restaurant. Locally-inspired seasonal American cuisine. Always excellent. There are also a number of quick, but good places to eat on the downtown mall. Virginia is the 5th largest wine producing state. Virginia is home to over 180 wineries, and growing quickly. Over 2,500 acres under vine. Chardonnay is the most planted white varietal in Virginia. Cabernet Franc is the most planted red varietal in Virginia. Though the subject of much debate and opinion, the varietals that seem to thrive here in Virginia are Cab Franc, Petit Verdot, Viognier, and Petit Manseng. I hope this post provides some useful information for those coming to WBC11. I look forward to meeting everyone that I’ve connected with via Twitter! If you have any specific questions about Virginia, Virginia wine, or this post, please do not hesitate to contact me. Cheers! Excellent post. I have added a link to this on the Details page of the http://www.WineBloggersConference.org website. For those of you planning your trip, remember we will soon announce a pre-conference excursion and probably also a post-conference excursion. This sounds like a great event. Make your reservations to stay at the Inn on Poplar Hill in Orange. http://www.innvirginia.info Just a short Country drive to Charlottesville, close to Barboursville, Horton and Keswick Vineyards. We have six guests rooms all with private baths. A full cooked to order breakfast is included with your stay. Hi Victoria – thanks for stopping by to comment. We have the Inn on our list of places to stay – heard great things! Hi Victoria – Thank you for stopping by to comment. And, a BIG thank you for providing the stemware for the event! We greatly appreciate your help! Hi Gwen – No, there is not train from Dulles. Washington Union Station is in downtown DC. You’d be better off flying in to DCA (Regan National), and then taking the DC METRO to Union Station, and then Amtrak over to Charlottesville. I believe there is a bus that will take you from Dulles to downtown DC to catch the train at Union Station. Regarding the train trip to NYC – I believe you’ll still have to go thru Union Station. Hope that helps! Hello Helene: Glad this post was helpful to you. Look forward to meeting you at WBC11. Cheers! A great place to stay just three blocks from the Omni and a couple of doors down from a great brew pub (when — heaven help us — you need a break from wine) is the 200 South Street Inn. If you’re inclined to splurge, my personal favorite is the Clifton Inn, just outside of Charlottesville. great info. We’re going to put this on our page. Excellent – look forward to meeting at WBC11! Will be in C’ville this weekend for winery visits and a Virginia Cider event. Thanks Frank for this WBC 2011 warm-up. I’ll be using it next month. After visiting Northern Virginia in April, I have started a short series called Tasting Virginia on my blog, something other WBC attendees might find interesting. Thank you, Mari. I appreciate you stopping by to comment, and glad you found the WBC11 resource helpful. Looks like you had a great time at Paradise springs – look forward to reading the rest of the series. See you C’vile next month – cheers! Thanks for the great information! I’m clueless when it comes to VA so this is very helpful, cheers! Many thanks for stopping by to comment. Glad you found this helpful. See you at WBC… Cheers!